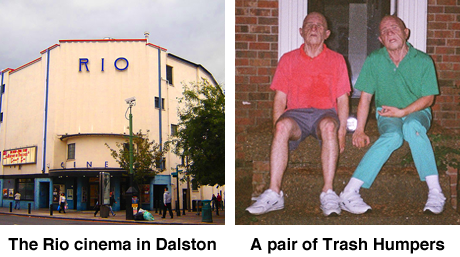 Would you like a pair of tickets for Trash Humpers this weekend in Dalston? As if we haven’t already bigged up Harmony Korine’s Trash Humpers enough, we’ve got a pair of tickets to give away for a special late-night screening of the film at the trendy Rio cinema in trendy Dalston in trendy London this Saturday. Trendy. I’m sure you can guess the terms and conditions. Winner announced tomorrow morning so be quick, fools.